in the pattern instructions, ysolda forewarns us: because of the ribbing, this sucker will look like three long, skinny tubes. because of all the sizing issues i've had with the sweater, i've been trying 'er on as i go. and now that i've attached the three tubes? i have faith. we're getting there. the construction of this sweater is incredibly unique, and the shaping is pretty brilliant. i ADORE those garter rib cuffs. 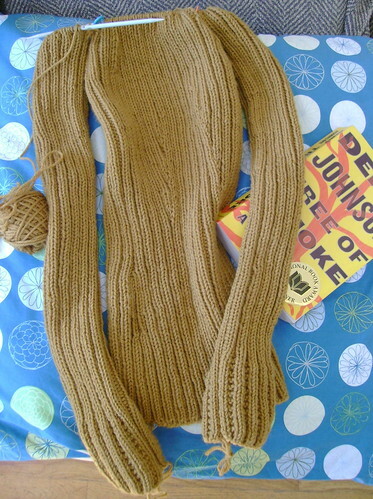 if i were to knit this again, i wouldn't have the single plain rib at the palm, but it doesn't bother me much. that said, my M1Ps leave something to be desired - like, proper tension. i've learned to sort of even things out as i go so i don't get too upset by the wonkiness; if anyone has a favorite technique for M1P that doesn't require a lot of fussing, drop me a line in the comments? the week's been crazy but this little gem popped up to brighten things a bit, so i thought i'd share. beautiful. Hi, I just love your 'Bella Mittens' I have tried to download your pattern. But have been unsuccessful would it be possible for you to email the pattern to me. I would love to knit these! Can't wait to see that sweater done and modeled. I didn't know they were doing Where the Wild Things Are- will have to check that out. Thanks for posting the trailer! I first heard about that project a few years ago and was starting to doubt if it would ever come out. Lovely sweater, too.